Merk Insights - Yellen to the Rescue? Our reference to water pistols refers to our assessment that bickering over discretionary spending is distracting from the real issue, entitlement reform. 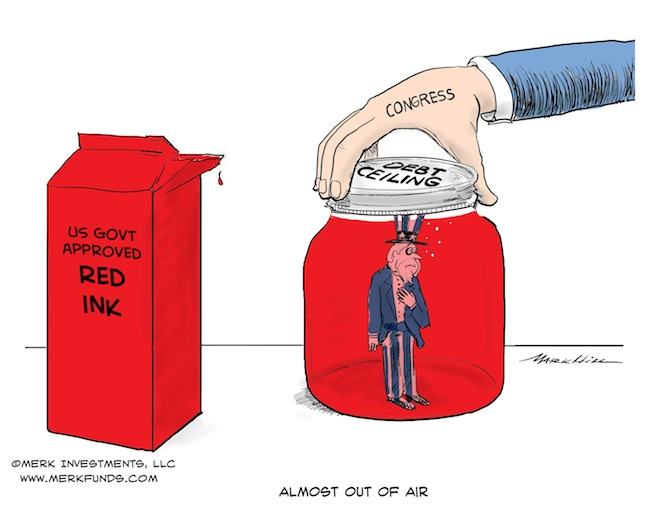 For details as to what we believe will happen if we don’t get entitlement reform done, please read our recent Merk Insight “The Most Predictable Economic Crisis”. Central banks in developed countries are generally considered independent, even if their members are appointed by politicians. In the U.S., however, there’s an added element: aside from a mandate for price stability, the Federal Reserve is tasked with promoting maximum sustainable employment. This simple concept might have been put in place with the best of intentions – who wouldn’t want to have maximum employment? Central banks that have a single focus on price stability, such as the European Central Bank, point out that the best way to foster sustainable growth is by keeping inflation low. The U.S., even with an employment mandate, had pursued the same practice. Introducing an employment target was nothing but an extension of existing policies, as it signals the Fed might keep rates low independent of where inflation might be. When the Fed meddles with fiscal policy, Congress will want to meddle with monetary policy. For example, when the Fed buys mortgage-backed securities it allocates money to a specific sector of the economy (favoring the housing market); that’s not what the Fed ought to do – it’s the role of Congress to channel money through tax and regulatory policy. One can disagree whether even Congress should be picking winners and losers in an economy, but that’s a political determination to be made by elected officials. When the Fed keeps rates low to promote employment, there’s a fair risk that important cues are removed from the market that would encourage Congress to show fiscal restraint. Congress has always loved to have a printing press in the back yard, but an employment target suggests that this printing press is going to be moved into the kitchen. The Eurozone may be proof that policy makers only make the tough decisions when forced to do so by the bond market; if, however, the Fed works hard to prevent this “dialogue” between the bond market and politicians, the most effective incentive to show fiscal restraint might be gone. Inflation is a clear risk when the Fed emphasizes employment. In our assessment, inflation may well be the goal rather than the risk in the eyes of some policy makers, as inflation lowers the value of outstanding government debt. In a democracy, it’s all too tempting to introduce ever more entitlements. As obligations mount, however, servicing these obligations might become ever more challenging. It’s nothing new that governments tax their citizens. But when deficits are no longer sustainable, governments may be tempted to engage in trickery. Structural reform, that is taking away entitlements, to lower expenditures would be the most prudent path to regain fiscal sustainability. Raising taxes is all too often the preferred alternative; while politically difficult, raising taxes is a strategy that’s all too often politically viable. Yet the path of least resistance may well be to inflate the debt away. Central banks ought to be independent to take this option away from policy makers. We have seen in the Eurozone that it can be most painful when the printing press is not at the disposal of politicians. Whatever happened to the government being the representative of the people? Interests of the government and its citizens are no longer aligned when a government has too much debt. The government’s incentive will be to debase the value of the debt. The U.S. may have an easier time debasing the value of its debt than some other countries, as much U.S. debt is held by foreigners who can’t vote in the U.S. Differently said, promoting a weaker dollar is another potential avenue for U.S. policy makers to kick the can down the road. But fear not, whatever policy is coming to a neighborhood near you shall be done in the name of fostering maximum employment. To learn more how investors can navigate a Yellen Fed, please register to join us for an upcoming Webinar as we dive into these dynamics in more detail. Also make sure you subscribe to our newsletter so you know when the next Merk Insight becomes available.